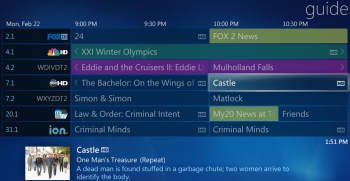 Last week I showed you how to add channel logos to the Windows Media Center TV guide. Today let's look at another guide tweak: color-coding the listings. See, if you're anything like me, you routinely flip through your hundred-plus channels in search of, say, a movie to watch or some college basketball. Much as I like WMC's comforting all-blue channel guide, it doesn't let me spot specific types of shows at a glance. Deep within WMC's settings, there's an option to enable color-coded listings. To find it, click through Tasks, Settings, TV, Guide, Guide Page Options, then click the check-box for Apply colored backgrounds to shows, based on their category. Click Save and you're done! By the way, this works in the Windows 7 versions of Windows Media Center; not sure about Vista.